Q: Where did you get the inspiration for your book? How Did you come up with the idea to write your book? While I have written all my life, I was drawn to poetry. I wrote poems all the time, even in my sleep. And, as poets did then, I put them in a folder never to be seen again. I didn’t care. I had said what I’d wanted to say. However, much later when I was following a course of study, my teacher and spiritual advisor suggested that I write a story about an old woman who had influenced my life. I had grown up in the company of old women, and each had shaped me with her home-spun wisdom and gentle teachings. My problem was not what to write. My challenge was to choose one particular woman to be the star of the show. I struggled with that decision for much too long before I realized that I could write about them all if I just took my time. Nonetheless, the assignment loomed, and I had to make a selection. I opted for an ancient neighbor woman who befriended me when I was very young, and the story “Mima Po” was born. Actually, the original story was only about two pages long. While my teacher was thrilled with it, I was not. It felt incomplete. So after I had handed it in, I went back and filled it out. In the process the tale metamorphosed from a memoire to a yarn whose basis was fact but which had been deeply fictionalized. And it had grown to 25 pages. I filed the story and went on to the next, using a composite of women for the elder. The second tale was pure fiction. Set in Canada during the Ice Age, it had absolutely nothing to do with my personal experience. And yet I discovered that the wisdom the crones of the tale provided was timeless. I thought about that for a while and realized that there are certain human experiences, certain human needs that simply have not changed. Regardless of the culture, regardless of the era, the basic human experiences of searching for food, clothing, shelter, love, recognition, and hope remain the same. That insight freed me to explore people of different cultures and eras while remaining true to the women I had set out to honor. Weeping with the memory of their compassion and affection, laughing at their silly antics, shaking my head at their gritty common sense, I had a wonderful time visiting with the women who had so enriched my childhood. Then I thought about my peers, those whose friendship I treasure now that I have beome an old woman. And so the story “Lavinia” came to be. I had eight stories, each written from a different point of view, each written in a different voice, most set in different times and cultures, but all peopled with the delightful women of my life. I was satisfied that I had accomplished my goal. I was happy with the work. The collection of tales would have moldered in my file, never to be seen, probably discarded at my death if my teacher and a friend hadn’t read the final drafts and had not nagged me into publishing them as a book. I had honestly always written to satisfy my own needs. I had never considered publishing. However, those two women were absolutely merciless. In fact, my teacher put me in touch with a woman she knew who had recently published her book. I sent the woman the first three stories, and she loved them so much that she put me in touch with her publisher. Vila SpiderHawk is taking a different view on the aging of womankind. 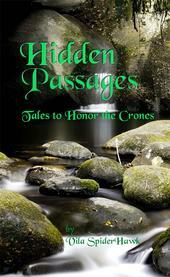 Hidden Passages: Tales to Honor the Crones is a collection of tales, some of which are interconnected, others which stand alone, all of which deal with women who are finding or already using the wisdom acquired from years of life experience. Vila SpiderHawk and her husband share a log home of their design in the woods of Pennsylvania where they live with their five cats and enjoy frequent visits with their many woodland friends. SpiderHawk is an avid gardener and a gourmet vegan cook. Stories begin in the most interesting places. Oh don’t they just begin in the most interesting places! What a wonderful story behind the stories, and how grateful I am that Vila’s teacher made her publish them! It would have been a huge loss to the world if they had “moldered in a file” and been discarded. This book is one of the most uplifting and enjoyable books I have ever read. Vila’s writing style is beautifully descriptive and an absolute joy to read. Hidden Passages is a wonderful book for people of all ages. Thank you so much, Jane! I really appreciate your kind words. And in truth, I’m grateful that my teacher got aggressive enough to force me to publish too. She really wouldn’t let the idea go! She was so funny!